The coach spoke to Twomey about the task that the team faced without their defensive captain. “We’re really close and they’ll be hurting tonight, and not just because of the loss but they’ll be hurting more for (him). We all will be. One of the other veteran players put the loss of their captain in perspective. Months later, that footy club and that playing group won the premiership, and the coach gave his championship medal to that injured captain. 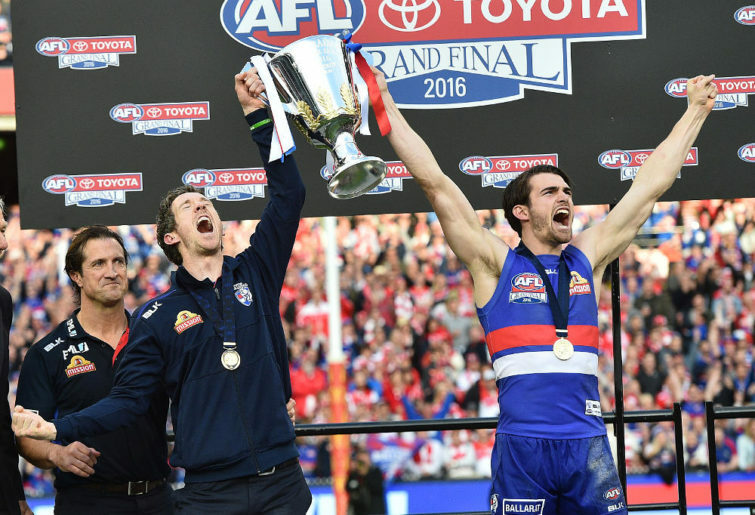 The captain was Bob Murphy, the coach was Luke Beveridge, and the “footy club and playing group” was the 2016 Western Bulldogs, who put their captain on a pedestal that motivated their drive through four games as underdogs in September to a legendary AFL title. 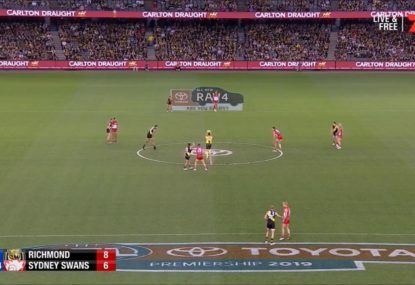 But the story and quotes above may very well have made you think the topic of conversation was Alex Rance of the Richmond Tigers, who also injured his knee in the third quarter on Thursday night. 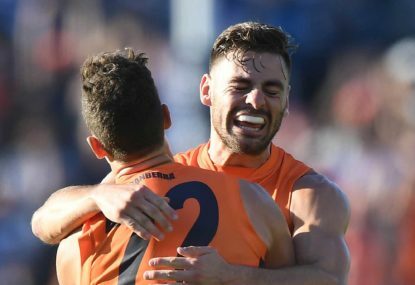 The blow very likely knocks the five-time All-Australian key defender out of the entire 2019 campaign and knocks the Tigers from the role of likely flag favourite to one of four or five equals who are all slightly flawed but have the tools to win the 2019 AFL premiership. 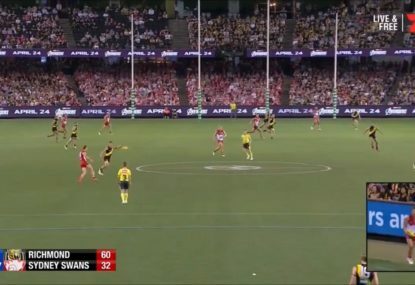 Over the summer, we all pointed out that a lack of depth might be the undoing of Richmond this season. 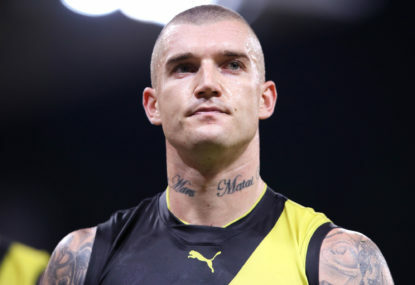 But they have a talented defensive line beyond “the Legend of Tagger Rance” (look it up if you don’t get the pun) – David Astbury, Nathan Broad, Brandon Ellis, Dylan Grimes, Bachar Houli, Oleg Markov, Kamdyn McIntosh, Jayden Short and Nick Vlastuin. Will they have to re-shuffle? Of course. But they’re mostly veterans, and they’ve had Rance’s example to work under for as long as they’ve been with the Tigers. And they will still have Rance’s example, because he’ll still be there to serve as a temporary unofficial coach, just as Bob Murphy was for the Doggies three years ago. Alex Rance is a man of character, just as Murph was and is. He’ll be there, probably in part out of a misplaced sense of ‘guilt’, as if he’s somehow ‘betrayed’ his beloved team by getting injured. If you question that, watch what he did at the end of the Carlton game last night. He came out with ice on his knee and sat on the bench, acting as if it was just a minor sprain, to give his team confidence and a joyful boost on the field when they had lost most of their lead to an upstart Blues team. The Tigers pulled away in the fourth, winning by 33. If you still question that, watch the interview with Channel Seven after the game, where he spent the conversation speaking about his team-mates, his club, and how exciting he is about his team in 2019. If you didn’t speak English, or if you didn’t listen closely, you’d come away thinking he’d gotten a turf burn on his kneecap instead of starting the 12-month-long road of pain, pitfalls, and perspiration that awaits him in rehabbing that injured ACL. His mugging for the sideline photographer reminded me that his life is so much more than his footy or his physical health. When other players came to console him after the game, it looked more like it worked the other way around – he was the one consoling them. That’s why he so valuable to the Richmond Football Club. And that’s why he’ll still be valuable to the team in 2019, because that part of Alex Rance is still working for the Tigers, even without functioning ACLs. 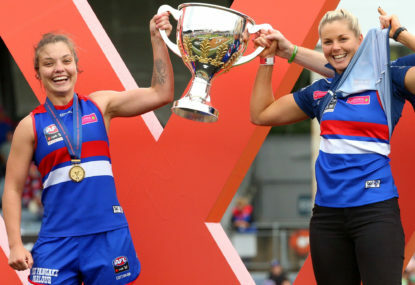 In 2016, the Western Bulldogs won their first title since the 1954 days of Footscray and a young Ted Whitten, in large part using Robert Murphy as their object d’affection. Last year, the West Coast Eagles lost superstar Nic Naitanui to injury and budding star Andrew Gaff to brain cramp and suspension, yet won the title when the rest of the team stepped up, in part in their honour. 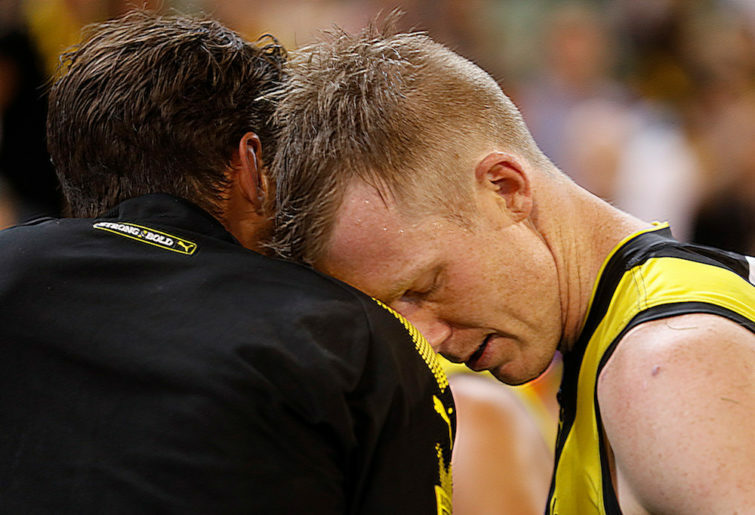 Why can’t the 2019 Richmond Tigers lose their superstar backman to injury, and then do as the Bulldogs and Eagles have done before them and use that loss to serve as their motivational talisman that spurs them to ‘win one for Alex’? Probably a good thing Brandon Ellis missed.